Violent and dangerous vehicle collisions are happening more frequently in Jefferson City, (Cole County), Columbia, (Boone County), and mid-Missouri in general. Major interstates and U.S. Routes like I-70, Highway 54, and Highway 63 span across the Midwest, and converge in the heartland of central Missouri. While many drivers and their passengers traversing these roadways are simply “passing through,” Missourians may fall victim to the negligence of one of these out of state drivers. Most car wrecks are avoidable. Distracted drivers, impaired drivers, improper vehicle maintenance, use of cell phones and other factors, alone or in combination cause wrecks and increase the likelihood for serious injuries. Missouri has seen a recent increase in drivers crossing the median on highways, often resulting in fatal head-on collisions when a driver loses control, careens across the median and then directly into oncoming traffic. A tragic example of this was recently reported on September 25, 2017, when a Kansas City resident traveling on I-70 was killed. For the full story, please see: Victim Identified in Fatal Accident in Boone County. This median cross-over and head-on collision resulted in Mid-Missouri State Highway Patrol Troop F’s forty-first fatality of the year, and eighth occurrence in the month of September alone. What should you do if you, a family member, or a close friend is involved in a high-speed collision? Obviously, first seek immediate medical attention for any suspected injury. Internal injuries caused by seat belt use and forceful impacts within the vehicle may not be readily apparent, and any abdominal or back pain should be checked out at the emergency department. No legal claim is worth prioritizing above the health and safety of the victim. There are, however, several other things you can do to ensure the validity of all available legal claims. As of January 2017, approximately 95% of Americans own a cell phone, and 77% of people own smart phones. Inexplicably, our office still receives police reports stating: “Evidentiary Photos: None.” From our experience in representing clients injured in serious car wrecks, we have learned of one important thing those involved in the crash can do. Take photos of the scene (especially if you are not injured but others in the vehicle are hurt), of the vehicles involved and of those who are injured in the wreck. If the wreck is serious or may involve a fatality, you can also ask the responding officer to take photos of the accident scene. Be sure to take photographs of treatment while in the hospital to document any injuries. Finally, document the recovery process with notes and photographs of physical therapy and rehabilitation. People respond more and feel a greater emotional connection when relating to images instead of just words. The more photographs you take, the more images your attorney has to work with when it comes to telling your story to the insurance adjuster, the defendant’s attorney, or the jury. The other driver’s insurance adjuster is not your friend, and neither you nor your family have any obligation to speak to one. Most citizens understand that when dealing with the police, “you have the right to remain silent, and anything you say can and will be used against you.” The same applies when dealing with insurance companies after a serious accident. Remain silent, until you have consulted with an attorney. The insurance adjuster’s goal in speaking with you is often to find ways to use your statements against you and to decrease the value of your claim. Let experienced legal counsel speak for you and refer all insurance communications to your personal injury attorney. Following a serious motor vehicle collision, your mailbox may be flooded with letters from insurance companies and medical providers. Keep everything. Start a folder or notebook and/or scan all paper documents and maintain a folder electronically. Keeping this information on hand will allow your attorney to quickly evaluate your claim and develop a pre-litigation road map. If nothing else, your attorney will already have a leg up on the competition by knowing the identity of the defendant’s insurance company is, the name of the adjuster to contact from that insurance company, and medical providers from whom to request medical records and bills. Save your receipts for medical purchases or co-pays. Keep a record or calendar of lost wages or missed time from work. Your case becomes infinitely stronger if your attorney can support your claim with good documentary evidence. Mid-Missouri is too often the setting for serious and sometimes fatal vehicle collisions. While tragic events like these may never be completely prevented, recovering for the harms caused by head-on collisions, median cross-overs and other serious wrecks can be dealt with more efficiently and effectively by taking evidentiary photos, knowing and standing by your rights, and preserving all key documentation. Remember not to sign a release or medical authorization without first speaking with an experienced personal injury attorney, and always consult an experienced personal injury lawyer before agreeing to any settlement with either the defendant’s insurance company or your own. 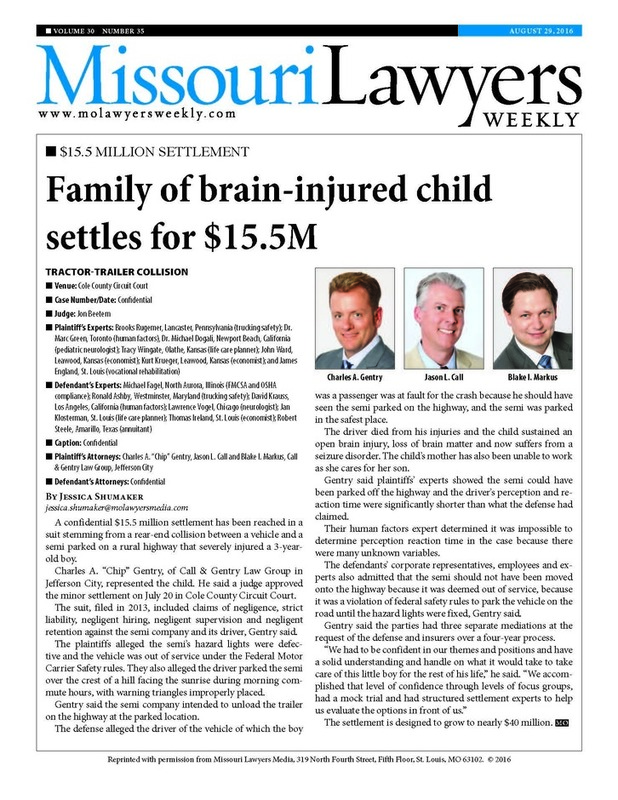 At Call & Gentry Law Group, our experienced Mid-Missouri personal injury attorneys are ready to assist you. Feel free to contact us at 573-644-6090 for a free consultation to discuss the personal injury claim that you or a loved one may have.